Sounding bizarrely like some alien cartoon character I can't quite put my finger on, their name doesn't give much of a clue as to what Zornik are gonna sound like. The cover art on "The Place.." makes you wanna believe they're gonna be a top notch punk affair. 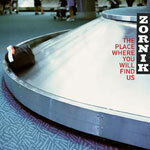 Zornik, however, are not punk. The vocalist sounds like he really believes what he's singing, which is nice. Unfortunately, he does a lot of his singing in a slightly nasal imitation of Muse's Matt Bellamy. Now, I don't know what makes a hit in Belgium, but, as far as I'm concerned, it isn't tinny-sounding synthesiser effects put against blandly beepy electronica backing in a vague attempt to sound 'prog'. Progressive means we move forward, lads, not that we drown ourselves in second rate Muse covers. And trust me on this, the trumpets on "It's so unreal" are not needed. An otherwise pretty good song, little bit of Emo staccato strumming alongside the Muse vocals, ruined by the unwarranted addition of a last-minute brass section. An obviously fake brass section at that. The real gems on the album are the instrumental track titled 'Instru7turns15' and a melodic little number called 'Sometimes'. The instrumental is pretty damn good. The guitarist is finally allowed some originality and builds up some unique sounds without an overwhelming synthesiser backing. The effects are there, but they are subtle. 'Sometimes' is just a beautiful little song that also benefits from the lack of synthesiser over-use, and the vocals only occasionally go slightly overboard. What are highlighted, as the hits by the sticker on the front, 'Love affair' and 'Hey girl', seem to me to be the weakest tracks on the album. Commercial perhaps, unoriginal definitely. The most interesting sounding track has got to be 'Wasting away', which starts out identically to Hotel California by The Eagles with a riff that sounds like the little brother of 'plug in baby'. It would be a great song if only you didn't find yourself humming along to a different song as it plays. And of course the vaguely operatic vocal interlude could be done without. Zornik: The poor man's Muse.